This post has been cross-posted from Forum One’s website. In the for-profit world, measuring the impact of communications and marketing efforts is by no means an insignificant task; however, such companies do have the benefit of clearly-defined target outcomes to do so. All of the common metrics—e.g., leads generated, products sold, customer retention—are ultimately in service of maximizing revenue and profit. In the nonprofit realm, the clarity in knowing exactly what you are trying to achieve, and being able to reliably measure your performance against these goals, is often much more challenging. How are your communications activities generating meaningful impact? Which of these activities are providing you with the greatest success? In March 2016, Forum One released a 10-question survey to shed light on how nonprofit professionals define and measure the success of their communications efforts. In all, 92 staff across research institutions, advocacy organizations, associations, foundations, academic institutions, and the federal government responded to the survey. Additionally, we conducted follow-up interviews with six nonprofit professionals to provide more context around their responses. The goal is for the survey’s findings to serve as a practical reference tool for nonprofits as they continue to develop and refine their communications strategies and measurement plans. 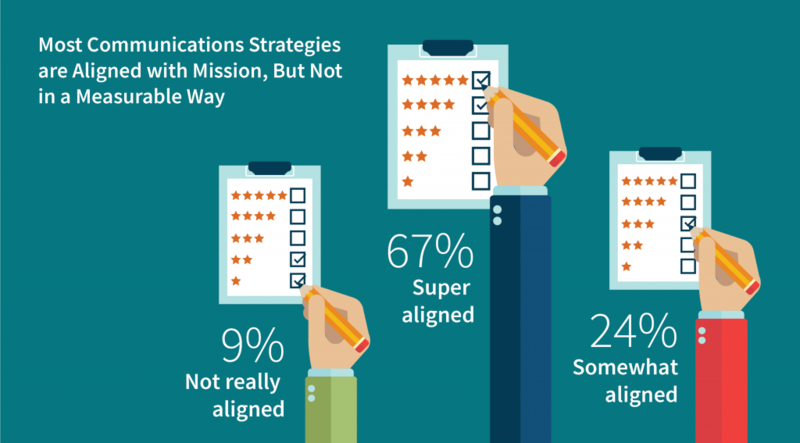 On a scale of 1 to 5, we asked respondents to score how closely they connected their communications activities to their organizational mission and goals? Two-thirds graded themselves as a 4 or 5. About one-quarter thought they did an average job in aligning their activities with their organization’s mission, and the remaining 9% thought there was considerable room for improvement. 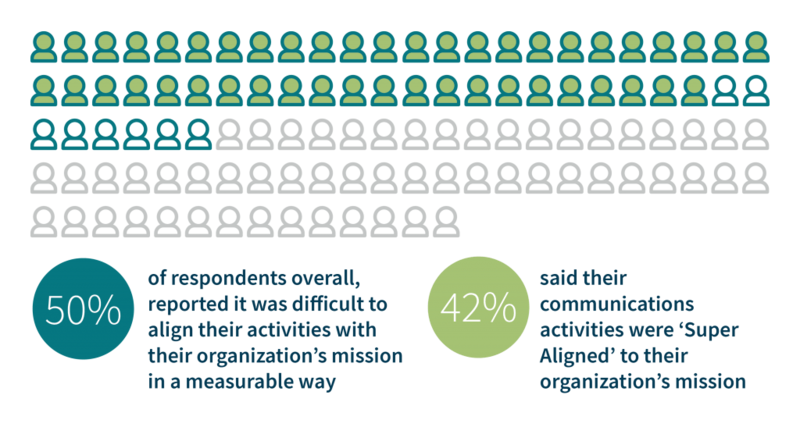 Slightly more than 50% of all respondents overall—and specifically 42% of people who said their communications activities were closely connected to their organization’s mission—said that it was difficult to align their activities with their organization’s mission in a measurable way. There is clearly a demand among nonprofit communicators—and those to whom they report—for guidance on measuring and communicating the impact of their work. Not a single survey respondent or interviewee said something along the lines of, “oh measuring impact of communications? We have that figured out.” Instead, I noticed among those I interviewed a humble and hopeful sense that at least one of their peers was getting it right. In all, 31% of respondents said they were actively tracking “impact metrics.” In the survey, we provided examples to guide this response: e.g., the number of policies referencing your research, the number of lives positively impacted through online donations, or a measurable public opinion shift on your issue. In other words, we wanted to know who was going beyond metrics such as unique website visitors, event attendee numbers, or media mentions of their organization and attempting to measure their influence on a positive change in the real world. Equally surprising was that issue advocacy nonprofits reported more difficulty in measuring impact of communications than research institutions. We had assumed, incorrectly, that since success for these groups is easier to define (e.g., policy victories, lives saved, conditions improved, public opinions shifted, etc. 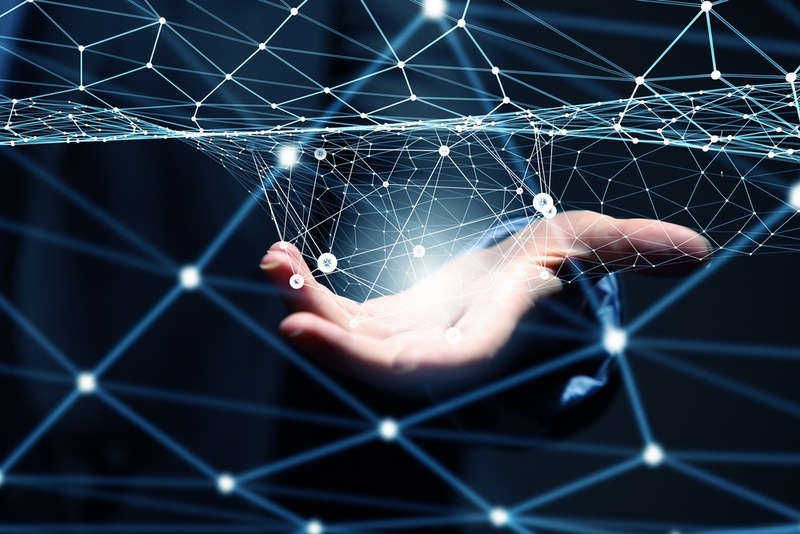 ), it would be easier to connect communications activities to progress against these goals. But perhaps movement on the issues these groups address happens slowly and with too many contributing factors to determine how best to measure its impact. More than 80% of respondents said they tracked “reach metrics” (e.g., number of press mentions of your organization, follower growth on social media accounts, search engine ranking for keywords) and “output metrics” (e.g., number of events hosted, number of tweets posted, number of policy briefs published). About 70% are tracking engagement metrics (e.g., number of event attendees, number of petition signatures, number of blog comments). In order to collect this data, respondents are using a long list of tools. 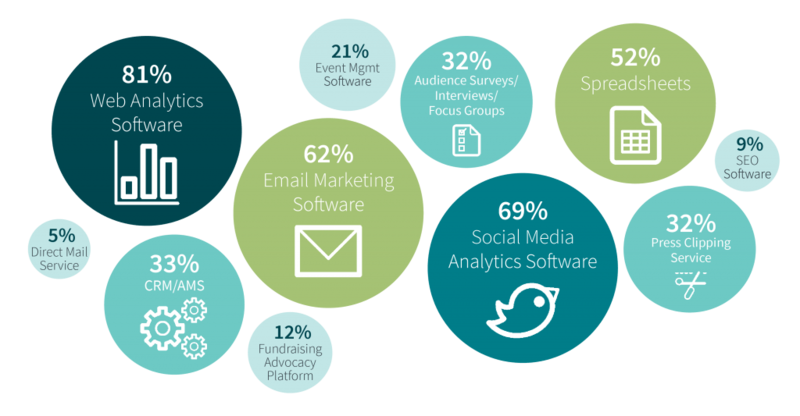 Most respondents reported using a combination of web analytics, social media, email marketing software and spreadsheets to collect data. Among interviewees, Google Analytics was consistently named as a primary tool used for communications data collection and reporting. Nonprofit Leaders Crave Communications Data, But Are They Asking the Right Questions? The highest percentage of respondents reported on communications metrics to leadership on a quarterly or bi-annual basis. Fewer than 25% reported monthly, and about 20% reported on an ad hoc basis. A significant majority of respondents said they produced these reports manually using a combination of tools. About 16% solely used web analytics dashboards. Only 3 respondents said they imported data from a variety of sources into an analytical software tool. Respondents identified “capacity” as the largest challenge in communicating about the effectiveness of their work. Interviewees from comparatively-small organizations said they felt a tension between “measuring and doing” communications work. They need guidance on what is most meaningful to track and report on, how to do so, and at what frequency. Some view the options available in a tool such as Google Analytics as overwhelming, and without proper training and direction, data capture and reporting initiatives can seem aimless and risk petering out. As mentioned, 92 individuals responded to the survey. 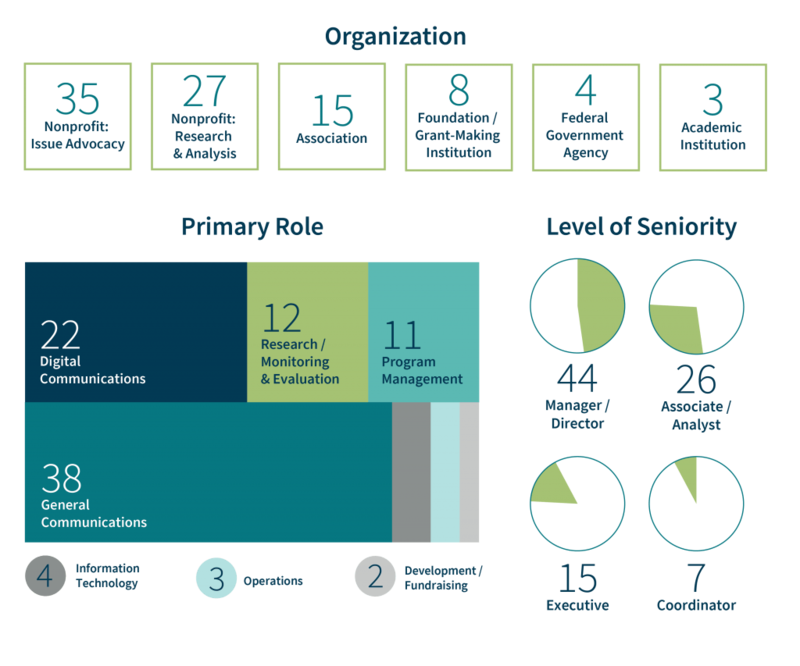 They represented a range of nonprofit and government organizations, roles, and levels of seniority as represented in the charts below. However, this work can often be challenging, time-consuming, costly and unproductive. I’ve heard anecdotally of million-dollar impact evaluations for communications-related work with findings that were, at best, inconclusive. Given these challenges, what guidance can we provide for nonprofit communicators? Several interviewees from smaller organizations reported that they were currently operating without a communications strategy. Others were taking steps this year to develop a plan for aligning communications activities with their organization’s mission. And for those with communications strategies in place, they wanted guidance on how to measure their impact. Goal: Reach, inform, and influence policy makers and/or practitioners with your research and analysis. Goal: Educate and inspire people to change policies, perspectives, and/or behaviors, or deliver a product or service to improve outcomes related to your cause. Goal: Increase the capacity and effectiveness of your members and their work. Goal: Improve outcomes in the focus areas to which you direct funding. Mapping communications strategies and tactics to organizational goals is a requirement for an effective plan. You might consider several of the above goals difficult to measure, and you wouldn’t be wrong. But that doesn’t mean you shouldn’t try. In considering this challenge, we were inspired by the new “Goldilocks” initiative at Innovations for Poverty Action (IPA), which is intended to help recommend “right-fit” monitoring and evaluation solutions for organizations who are not good candidates for randomized evaluations of their programs. IPA states that, “the desire to measure impact often leads organizations in one of two dangerous directions: collecting mountains of data that cannot be used to measure impact or collecting insufficient data to demonstrate accountability and to learn what to do in the future.” Similarly, I would encourage nonprofit communicators to consider their goals and activities and identify a limited number of impact or proxy impact metrics to target. Reach, inform, and influence policy makers and/or practitioners with your research and analysis. Impact Metric: Citations of your research in policies. Educate and inspire people to change policies, perspectives, and/or behaviors, or deliver a product or service to improve outcomes related to your cause. Impact Metric: Improved outcomes linked to your campaign or intervention. Proxy Impact Metrics: Public opinion shift on your issue, evidence-supported actions taken to address issue (before true impact can be measured), proposed legislation in support of your cause. Increase the capacity and effectiveness of your members and their work. Impact Metric: Increased productivity and influence across your sector. Proxy Impact Metrics: Advancements or awards for your members, share of voice among members on relevant topics, increased funding/revenue across membership. Improve outcomes in the focus areas to which you direct funding. Impact Metric: Improved outcomes linked to funded work. Proxy Impact Metrics: Key evidence-supported actions or policies informed by funded work, increased awareness around focus areas and work of grantees, share of voice among your experts and grantees. Any discussion of impact metrics naturally leads to the question, “how much of this impact can we take credit for?” Often there are countless factors that influence an outcome and its impact, and it would be disingenuous and inaccurate for an organization to claim sole responsibility for a victory. We recommend considering your organization’s specific contributions, but not agonizing over them. You can hire external evaluators for a similar assessment of your communications work, or you can make an educated guess. For example, if you are the only organization focused on a niche issue and a policy for which you advocated was instituted or changed, your work could be considered decisive. If public opinion shifted on an issue on which you and other organizations have actively campaigned or conducted research, you could consider your contribution important. While you should tread cautiously in using an unscientific self-assessment in external communications about the impact of your work, a “decisive” or “important” rating could inspire your colleagues internally to continue their influential work. Others reported leadership’s fixation on metrics such as website unique visitors, which alone can have little meaning or consequence. It’s critical for nonprofit communications professionals to better educate their colleagues about defining meaningful metrics, and how doing so can help the organization make better decisions about how to invest in communications activities. Be transparent about the imperfect science of communications measurement, but also don’t shy away from using relevant data to advocate for your work. Reporting on communications metrics should not be about volume. By all means, capture as much data as you can — you may find some utility for it. But just because you’ve captured it, doesn’t mean you need to analyze and report on it. Focus on what’s meaningful and actionable. If your overall website page views are down 5% this quarter, what does it mean and what are you supposed to do about it? These questions are nearly impossible to answer because “pageviews” in isolation doesn’t mean anything. However, if you are a think tank and fewer visitors are accessing your publications and/or spending less time reading them, you should dig deeper and consider improvements to your email or social campaigns, search engine optimization, site architecture, or content strategy. Targeted, and tested, improvements can lead to increased reach and engagement, and ultimately impact. This survey was conducted by Forum One. The analysis was authored by Brian Pagels. It has been cross-posted from Forum One’s website.